Engineering Dynamics LLC is a full service precision CNC manufacturing facility with capabilities ranging from initial design to large scale production. We provide quality parts and support to an array of markets including Military, Medical, RF/Microwave and Automotive. Working with such a diverse group of customers exposes Engineering Dynamics to a multitude of different requirements. Whether it be quick turn around, complex part machining, or simply competitive pricing through innovation, we have the skill set to get the job done. 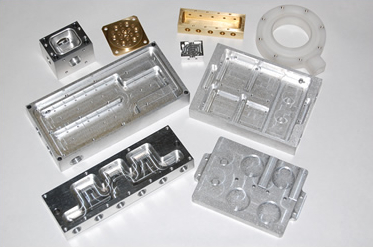 We have years of CNC machining experience, as well as CAD/CAM design, reverse engineering, prototyping, and state of the art CMM quality assurance. We also offer full design services that can transform your ideas into a solid model and then prototype it and, once approved, take it into production. No matter how complex your design is, we can offer solutions for even the most difficult machining challenges. We are dedicated to supplying our customers with the highest level of quality, support and customer satisfaction. Our focus is to deliver parts that are not only complete to the print, but on time every time. This is achieved through our years of manufacturing experience with tight tolerances and short lead times. Our ability to work from any form of digital media helps to ensure the utmost accuracy and efficiency. We invite you to take a tour of our site to get a better understanding of our capabilities and philosophies. Although we are interested in providing you with solutions to your short term requirements, we are driven to create a long term relationship. "Engineering Dynamics has been instrumental in providing innovative high quality solutions and products at a competitive price routinely meeting the aggressive delivery demands of Wireless Telecom inc. Their ability to consistently deliver tight tolerance products with great service is second to none." DIRECTOR OF OPERATIONS WIRELESS TELECOM GROUP INC.